Determine application of new technological trends as they pertain to business needs. 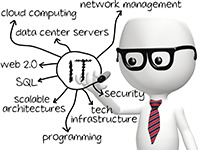 Any IT organization regardless of size should have a solid definition and understanding of their IT architecture. There are many different methodologies that help enterprise architects to develop and maintain such a definition. Generally, an enterprise architecture definition comprises four basic components: business process, data, applications, and technology. However, these components do not differentiate explicitly between core and supporting business processes. This differentiation is important because the core business processes are the primary processes that enterprise architects need to focus on to continuously reevaluate and improve. Maintaining the focus on the core processes will help to avoid some of the more common pitfalls that come to mind. As mentioned, a good enterprise architecture framework considers business process, data, applications, and technology. However, the documentation of an existing landscape can be very labor-intensive and can take a long time. There is no question that some form of documentation is necessary; the question is, what is strategic? The decision regarding scope of documentation is a gray area, and this is solely based on the experience level of the architect. Keeping the core processes in focus will help to determine an appropriate documentation scope. An argument could be made that enterprise architecture is too futuristic and does not engage in the business discussion. In this case, enterprise architects are always trying to find the latest and greatest technology or trying to apply the latest IT buzz. Enterprise architecture doesn’t always mean evaluating and selecting new technology; often it means making existing technology work better. This important function requires that enterprise architects find ways to deliver solutions faster and streamline and enhance existing solutions. This is strategic enterprise architecture. Enterprise architecture runs the risk of focusing on standardization to the point that new solutions are not considered because they don’t fit into the current tools and application portfolio. Standardization is critical in elevating IT efficiencies. However, standardization and policy definition cannot become the means to the end. An enterprise architect who is thinking strategically will know when standards and policies must change to solve a business issue. IT management must consider enterprise architecture as strategic if the objective is to be considered strategic within the overall organization. On the flip side, enterprise architects must perform their function as strategic. This means demonstrating agility in adopting potential new technology that can solve a business problem instead of standing their ground in postulating a standard. It also means developing a good documentation framework that is reasonable instead of engaging in endless documentation exercises; and proposing pragmatic solutions that do not always require the latest and greatest but do optimize existing technologies. The strategic importance of enterprise architecture is not only determined by IT, but also requires the input from the business. If the business is not convinced of the value contribution by enterprise architecture, then it will be hard for IT management to elevate enterprise architecture to strategic importance within the organization. Therefore, IT management needs to ensure that these feedback channels exist so that positive changes can be introduced and enterprise architecture can maintain its strategic position.